Classic turntablism is always impressive, but it doesn't make up for lack of variety. In early 2007, after battle-tested turntablists/former X-Ecutioners Rob Swift, Total Eclipse, and Precision performed alongside each other in Manhattan's Lower East Side, they acted on a jolt of sheer spontaneity and began rocking stages and recording as a unit again. 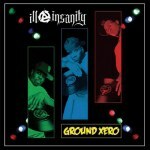 Rather than calling themselves Ground Xero, as was the original intention, the trio instead pinned the name on their debut and were billed as Ill Insanity from that point forward. Their quickly-issued Ground Xero is a throwback, a tribute to the prime of turntablism's marriage of old soul breaks, persistent sampling, and cuts as a mystifying phenomenon. One peek at As the Tables Turn, an introspective interview-loaded documentary chronicling the career of turntablism architect Rob Swift, identifies the art of manipulating records and mixers as a once-viciously popular and admired hip-hop sub-genre before its enthusiasts and interest, for the most part, faded into thin air. Swift and his celebrated contemporaries (Precision has earned many accolades, and was most recently dubbed a DMC 2007 US National Finals Champ; Eclipse can say the same, with an International Turntablist Federation World Championship to his credit) shred masterfully on Ground Xero, and aside from one track, no emcees get in the way; this is strictly a scratch record a la Q-Bert, rife with dusty snare taps against a slew of cuts, over and over again. Between samples of late '80s era Kool G. Rap verses, Ground Xero's "5 Fingers of Death" retains the same slumping tempo throughout, and with a hand from Q-Bert himself, Ill Insanity piles on scratched-in vocal snippets and looming string sections. The recognizable break never shifts into anything more than its kick/snare combo, outside of dropping out once or twice. While a colorful new phrase is introduced and quickly adjourned a couple of times, a twist in "5 Fingers of Death"'s rhythm would do wonders. Gloomy downtempo disquiets the formulaic structure that mars some of the record: "Nonverbal Communication" rumbles with organ and stretched sax cuts like those mangled by Kid Koala on Deltron 3030's "Madness", and "Sound Science" plays up Ill Insanity's shadow-obscured dark side, too, with creepy-as-hell violins and manual, vinyl-driven percussion. Atypical tempo changeups and more of their onstage stunts would benefit Ground Xero's perhaps premature arrival, but a bigger helping of its cloaked evil would ensure the spark that Ill Insanity is capable of firing into turntablism's unfashionable status.